Wow...is it Wednesday already? How did that happen? I barely blinked over the weekend and it's the middle of the week already! 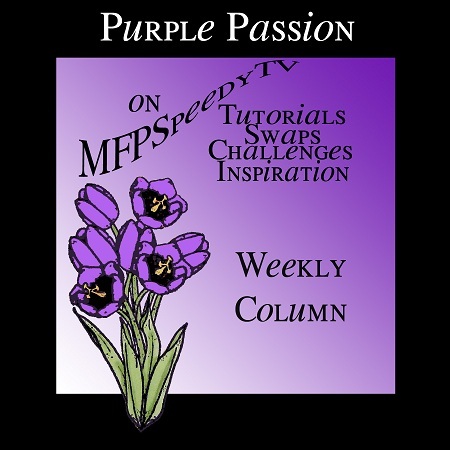 Well, I guess that means it's time for another Purple Passion Column over at MFP Speedy TV. Ya know, one of the things I've learned about using lots of purple in my work, is that sometimes, less is more. I love the color and I love using it, but sometimes, just a little gives a lot of impact. 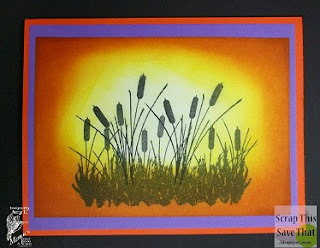 This week, I made a card using the Mark's Finest Paper Marsh Silhouettes stamp set. I stamped the images on white cardstock with black Memento ink and let it dry thoroughly. Then I used my Tim Holtz Distress Inks in various shades of yellow and orange to give a hot sunny summer day effect. I started by spreading Squeezed Lemonade ink all over the page, and then careful to leave the center alone, I continued on (in this order) with Mustard Seed, Scattered Straw, Wild Honey, Spiced Marmalade, and then hit just the very outside edges with Rusty Hinge. I love the effect this technique gives! To finish the card, I framed the picture in purple and then in a shade of orange that matched the darker inks. Orange and purple are on separate sides of the color wheel, so they work beautifully together, but since the oranges and yellows were the stars, I let the purple take a backseat ...this time! Thanks so much for joining me today!! If you're looking for more purple inspiration, take a peek around the blog... you're sure to find TONS more purple projects! Just the perfect amount of purple! Wow! This card is so beautiful! I just love how you created the sunshine! The deep orange so close to the purple is such a perfect contrast! I've been so busy swapping on An Altered Place, that I haven't been blogging much, but I'm going to do better!